individually wrapped. I think you just need to look at your price point, how many shoeboxes you'll be packing (do you prefer buying 144, or ten times that many), and also, with one costing half as much as another, you could also send two for the price of one. 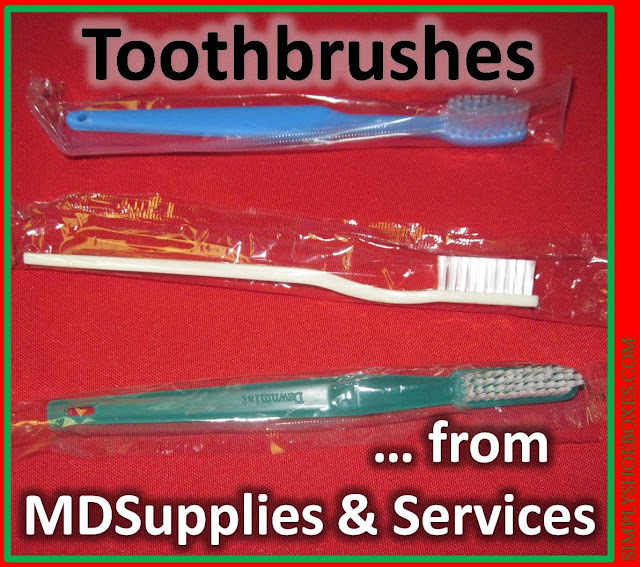 Toothbrushes (4861). These are sold for $60.39 for a case of 1440 so about 4 cents a piece. These don't look too sturdy, and have a thin handle, but actually seemed to work well. It was a little on the firm side, but not bad. 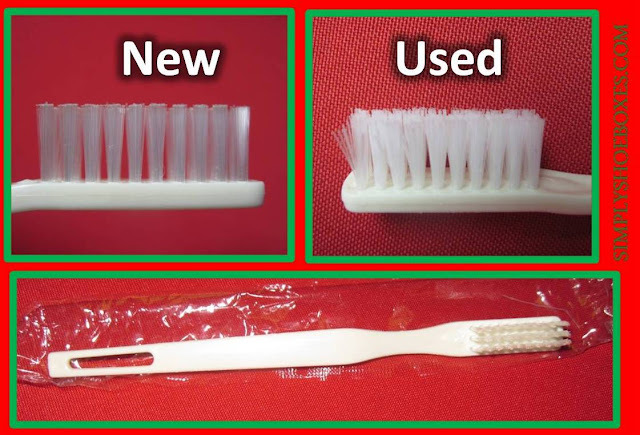 It held up just fine, no lost bristles, I think it's a perfectly good option for shoeboxes, and at the cost, you could even possibly send two! 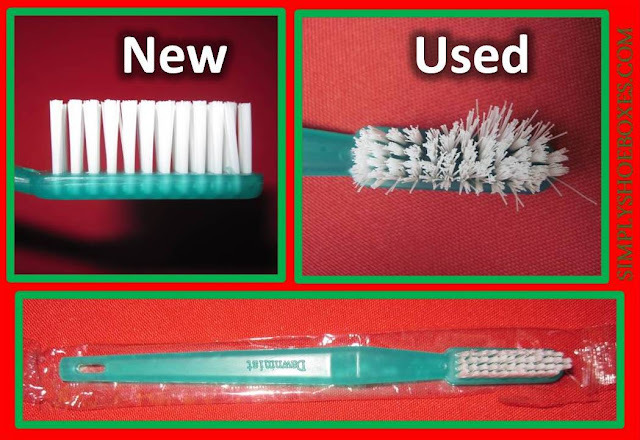 Toothbrush - 46 Tuft White Nylon Bristles, Green Handle (TB46) These are $86.71 for a case of 1440 so about 6 cents a piece. The shape of this handle is closer to current toothbrushes, being angled. It felt good to brush with. 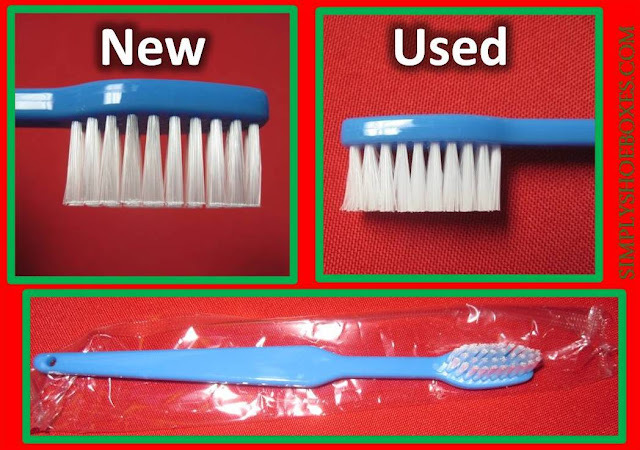 It wasn't as stiff as the other two, was a softer toothbrush which I liked, but it did cause the bristles to not look so good after use, but still worked fine, and didn't actually lose any bristles. Another good OCC shoebox option. Adult Toothbrushes (3395-2). These are $14.98 for 144 so about 10 cents a piece. These are the nicest looking of the three we tried. They "look" like a nice toothbrush. They are VERY sturdy! The one downside is that they are very stiff...my sister has sensitive gums and decided to quit the test because it felt uncomfortable after a while. But it didn't lose any bristles and was quite nice. They actually sent us a whole gross as a sample, so we'll be using these in most of our Operation Christmas Child shoeboxes this year, and I feel good about sending them. I have also reviewed their toothbrush holder if you are interested you can find it here: Dukal Hygiene Cases Review. 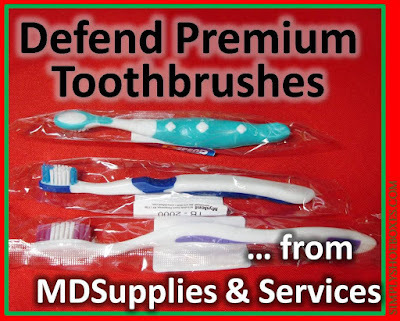 I hope this review helps someone...if you have any further questions, please just ask and you may want to check out the rest of my MD Supplies & Services Reviews for items appropriate for Operation Christmas Child shoebox packing. Toothbrushes are the 1 item I insist on putting into every shoebox. Sometimes 2 brushes go in just in case an adult snatches one. I hope the people who check the shoe boxes don't remove the extra toothbrushes when I include 2. Also a holder of some kind goes onto the brushes too; sometimes the over-the-brush cap and other times the long hollow kind. The place you featured today seems to have good prices. Thanks for the tip. Lin K, I volunteer at the Dallas processing center each year, inspecting boxes. I can assure you that nothing, other than restricted items, gets removed from a shoebox gift. We acknowledge that each one was lovingly packed w/ great consideration as to what went inside. Also, if we have to remove a restricted item, we replace it w/ something else from our selection of fillers. Hugs from Texas!